The SureColor SC-F2100 is the perfect t-shirt printing solution if you are looking to upgrade your equipment, complement your existing tshirt business. The SureColor F2100 5 colour is CMYK + 2xWhite for printing on all coloured garments as it prints white first and then colour on top. 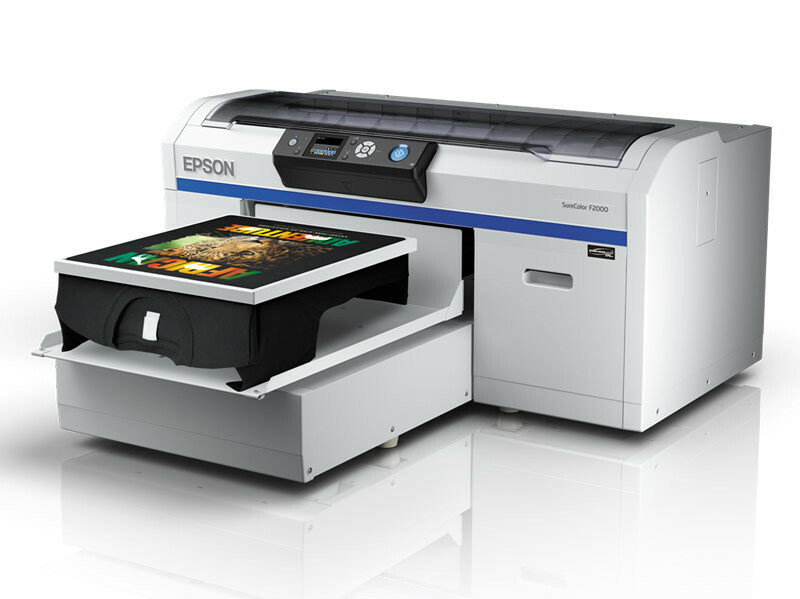 The SureColor SC-F2100 is entirely designed and built by Epson. It delivers maximum quality, superb productivity, ultimate flexibility and total reliability - complete with low running and maintenance costs. Print directly onto material made of 100% cotton or blended materials with a minimum of 50% cotton. The SureColor SC-F2100 is easy to set up and operate so you, or anyone within your business, can use it. The height-adjustable garment platen is designed for fast, straightforward loading and access via a colour control panel at the front of the printer. The automatic printhead cleaning and white ink circulation system allows for excellent and consistent print output every time. The SureColor SC-F2100 requires minimum daily maintenance thanks to its automated maintenance. The 1440×1440dpi resolution of Epson’s Micro Piezo TFP printhead and UltraChrome DG inks with white, deliver a wide colour gamut and smooth colour gradations. In its fastest print mode - dual CMYK - the SureColor SC-F2100 prints a t-shirt in just 27 seconds1. A choice of high-volume 250 or 600ml ink cartridges allows you to print for longer. In one affordable, fully-featured direct to garment solution we provide everything you need to produce t-shirts quickly, easily and very competitively. The Garment Creator design software comes as standard with the SureColor SC-F2100. Using the Garment Creator’s simple, intuitive user interface you can design and customise t-shirts. The software allows you to save predefined colour management and layout control presets, thus making it easy to deliver consistent results. Using Garment Creator you can print on dark t-shirts using white ink without having to pre-edit the image, as the software automatically generates and prints a white under layer.